The concept of copyright for artists is important for you to understand. You need to know the basics of copyright law, both to protect your work, and to respect the rights of others. Under US and Canadian law, your creative work is automatically given copyright protection as soon as it is created. You don’t need to put a copyright notice on the work, and you don’t need to register the work with the copyright office. The US or Canadian copyright will be honored in other countries as well, even if the requirements in those countries are different. 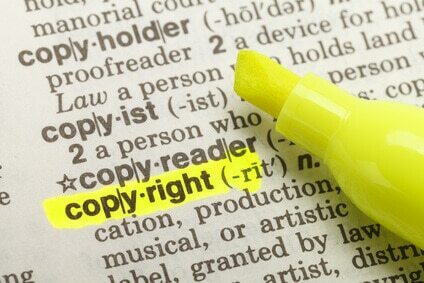 Registering your copyright clearly documents your authorship and ownership of your work. It also gives you a few advantages under the law, such as the right to sue for statutory damages, but it is not necessary to secure your basic rights. Because there’s a small fee to register your copyright, you might not want to register every work. Consider registering copyrights for particularly important or valuable works, and not bothering for less expensive works. Whether or not you register your work, put a copyright notice on any page where it appears. As we stated above, this is not required by law to protect your work, but it serves as a warning for those who don’t know the law. Copyright protection of your work means that nobody can copy, publish, distribute, display or perform your work without your permission, for the duration of the copyright. Under current law, the duration of copyright is the life of the author plus 70 years; your heirs can inherit your rights to your work. Fair use (or fair dealing, as it is known in Canada) allows limited use of copyright-protected materials, even without permission or payment. Permitted use includes criticism and commentary, parody, news reporting, teaching and research. The material used should be the minimum needed. For example, if someone reviews a song, they may include a couple of bars, but not reproduce the entire song. The fair use should not compete with or substitute for the original work in the market. Fair use law is complicated and subjective; it’s best not to assume a copy is fair use without expert legal advice. Ask friends, family, and colleagues to watch out for copies, and alert you as soon as they see one. This technique is surprisingly effective. Often the people who copy your work are indirectly connected with you, and therefore they are also likely to be connected with others in your social and professional network. Use online search tools, such as Google Image Search or Tineye.com, to search for copies of your images. Search for a good sampling of your work (6 or 8 of your most popular images), and repeat your searches on a regular basis. 6. What Should You Do If Your Work Is Copied? Do nothing. If you believe that the copying is “fair use,” or if the person has made a small copy and credited you, you may choose not to pursue the matter. Alternately, you could send a note asking that the individual get permission in the future. Send a cease-and-desist or demand letter. If you want the copy removed or destroyed, or if you want to be paid for the copies already made, then you can start by sending a letter claiming your rights and stating clearly what you expect. You can find many free templates for demand letters by doing a web search. If there is a lot of money involved (for example, if someone has been distributing copies of your work commercially), you should have an attorney draft and send the letter on the law firm’s letterhead. Submit a Digital Millennium Copyright Act (DMCA) takedown request. If the unauthorized copies appear on the Internet, under US law you can contact the web hosting provider and request that the copies be removed. Although the law applies only within the United States, internet companies in other countries will often comply with takedown requests. To send a DMCA request, you’ll need to identify the company that hosts the website, and locate their contact information. File a lawsuit. You will need to discuss your options with a lawyer if: (1) the person who copied your work doesn’t comply with a demand letter, (2) there is a lot of money involved, or (3) your art business is being damaged. You’ll need someone who specializes in copyright law, intellectual property law, or perhaps Internet law (a growing specialty). You can obtain a referral from your local bar association. You may also be able to get help from Lawyers for the Arts if there is a chapter in your area. My artist friend, Jeni Gray, accurately points out on Facebook that this is not complete information, which is to be expected in a blog post. She mentions the Art Law Journal for more in-depth details on copyright for artists. Put it on your list!